I came upon Dod’s writings as a natural consequence of searching for the books published by the Fowlers in local bookstores. The Fowlers were the primary publisher of alternative writings from the mid-1800s to about 1865. [The occasional co-publisher at the time and later succeeded Orson Fowler was Samuel R. Wells, who bought out this company in the 1870s.] I was researching the history of alternative medicine in Oregon. I was particularly fascinated by the fact that there were so many books from New York dated between 1845 and 1865 produced by the press of the Fowlers or Fowlers and Wells . All of these were on topics that had something to do with health and well-being, human psychology and metaphysics. These publications weren’t hard to recognize on a shelf in a used bookstore. The oldest ones tend to have this mild brownish cover, with a partial calfhide look that leaves behind evidence for an underlying cloth base. These books often all appear alike from a short distance away, although their contents can be quite different depending upon the author. These books are almost always small octavos measuring about 5″ by 7,” with about 150 to 200 pages, and a plate in the beginning with a drawing of the author. This common size for the book could easily be due to the size of the printing press for the time and the new methods printing developed. But another possible reason for this size was due to the fact that these books were just the right size to fit into the pocket of a gentleman’s or lady’s coat. The book was small enough to enable a reader to use it to pass time while traveling by way of steamship, train, stage-coach or wagon. A lot of people became familiar with the Fowlers books and the programs these books promoted in this fashion. The Fowlers sponsored and produced numerous lectures on a variety of esoteric subjects related to the popular culture for the time. These included such things as child behavior and raising, the healthy family relationship, living the perfect spiritual life, single or married, finding your true career, learning about your possible destiny in life. In the beginning, the most important writings published by the Fowlers pertained to physiogonomy and phrenology, and many of the teachings on psychology,and behavior promoted by Spurzheim. Nearly all of these topics were provided in New York city as part of a lecture circuit, with a philosophy and alternative way of living and thinking that was much like the atmosphere of residing in Greenwich Village and Soho New York today. For most of these lectures, the Fowlers printed books to go along with a the lecture series. These books had a number of chapters, one chapter per lecture. The purpose of the series was to develop a following for each series, and try to get your most devoted followers to participate in a program that involved you as a participant in the lecturer’s evaluation of human psychology, personality and spirit. But the Fowlers were more into just spirituality and the new religion being bred by such people as Mary Baker Eddy. They were also practitioners themselves of several of these disciplines and as experts often toured the country providing classes on them everywhere from Boston and New York to the larger towns in the Midwest and as far west as California. At each of these classes, they liked to engage the students completely and thoroughly, to such an extent that nearly every student who took such a course and purchased the book had this book signed by the teacher. This was evidence that he or she had finally made an important change in life. On occasion, these books even had notes kept in them by the students, coauthored at times by the lecturer. Such was the case for a book of magnetism and early hypnosis I discovered. It had notes penned into it by a student, being assisted directly in his note-taking by Reverend John Bovee Dods. Rev. John Bovee Dods was one of the few religious trained practitioners who helped to define the popular culture taught along the east coast lecture circuit making its way from the Washington, D.C. are to Philadelphia and new York City, to Hudson, Troy, Albany, and then across to Boston. Reverend Dods resided in Boston, but frequented the various lecture halls along the east coast trying to promote his own take on the philosophy of Franz Anton Mesmer published more than 50 years earlier. Since the Hudson Valley had well-defined economic or commercial routes, and Dods made good use of the ships, stage coaches and on occasion trains following these routes, he was able to rise in popularity fairly quickly due to his own unique philosophy of magnetism and hypnotism. But Dods wasn’t the first to introduce hypnotism in its earlier period of history to the valley. The knowledge of this earlier form known a mesmerism came to the valley as a part of traditional Hudson Valley behaviors and history. What Franz Anton Mesmer started for the valley, a number of other people continued and then brought to their next level of sensibility and intellectual reasoning. During the late 1700s, John Wesley promoted his belief in electricity as a way to the spirit world. This promoted and at times closely matched similar teachings prevailing in the Hudson valley between 1790 and 1805 regarding the use of static electric cures as a possible mean to revitalize the body’s lost life energies. The strongest advocates of this healing philosophy were the local Quakers (see my Shadrach Ricketson work), the primary promoter of which resided down in Dover and advertised his curing devices (probably obtained from England) in the local newspaper. Another metaphysician to introduce a new spiritual concept to medicine around this time was Samuel Hahnemann, the inventor of homeopathy. Hahnemann claimed that medicines bear some sort of energy or power (not exactly his terms) that is assimilated when the body takes them, and by taking very small amounts we kindle a reaction in the body that help promote the natural defenses we have against whatever symptoms are being treated, and therefore the disease attached to those symptoms. This philosophy is incredibly close to the another philosophy of cure for the time, the inoculation of small pox. Just how and why these philosophies surfaces in the local region is interesting. It is possible that people were simply looking for some new belief system to adhere to and abide by regarding health, psychology and disease. People were certainly becoming dissatisfied by regular medicine, and its use of “poisons” to treat an illness, such as the extracted chemical of a plant (quinine, laudanum) or the production of the much stronger mineral remedy equivalents for a disease (mercurials, iron tonics). To turn to either mesmerism and his teachings, or Hahnemann with his philosophy, for people in the Hudson Valley, could very well be a result of the local trends in belief systems for the time, beliefs triggered by the writings of other local physicians devoted to metaphysicians, the most important of which was Cadwallader Colden. Mesmer was an Austrian physician, who claimed the human body contained an “ether”, which was a magnetic substance. He claimed that the popular belief in animal magnetism could be explained based on this philosophy. A century earlier, physicians were preaching that there was some sort of animal spirit that could be responsible for the ability of a snake to “charm” its prey, placing it in a trance in order to facilitate and make certain the fatal bite. This animal spirit had its professional physician’s and scientist’s interpretations wandering about the popular press and science books, but one of the more important in local history which we shouldn’t ignore are the writings of Cadwallader Colden. Colden and Isaac Newton had their conversations at time about gravity, light and other universal energies that seemed to be in control of how everything was so well orchestrated in behavior, and as some late 1700s and early 1800s readers of Colden’s metaphysical philosophy of the world understood, this energy was the same energy found in living beings, no matter how large or small they were. As I have discussed in my section on Colden’s philosophy, this less mechanical, much more metaphysical take on the universe than Isaac Newton was offering had an attractiveness to it that many non-mechanists favored. To some, it was a perfect replacement for the old-fashioned Newton’s Grand Theory of things. The second individual to develop his own take on the metaphysics of the universe around 1790-1800 was Samuel Hahnemann. We never really associate Hahnemann’s teachings of homeopathy with Isaac Newton or Colden’s metaphysical writings, but because Hahnemann had his own interpretation of these popular beliefs, he was able to develop his own method for practicing medicine. Hahnemann claimed there was this internal energy that existed that could be applied to health and medicines. He claimed that medicines can heal due to their energy (or however one might refer to it during that time), not necessarily because of their physical make up (i.e. chemistry). Supporting Hahnemann’s paradigm on this healing mechanism was the success of inoculation programs underway. Hahnemann’s own experiences with exceptionally small amounts of a medicine used to treat fevers, in turn gave him fevers. This observation couple with the observations on inoculations would have seemed quite sensible, if some sort of metaphysical cause existed. Mesmer along with many other scientists and physicians was very interested in the metaphysical aspects and causes of disease and health. Mesmer developed his philosophy on this very philosophical question and published it in his treatise in 1774. In this treatise, Mesmer claimed that magnetism was the cause for some diseases, and therefore some diseases should be treated by way of controlling this energy found in patients. He most strongly favored the use of magnetism for treating nervous disorders. This may have part been related to the increasingly popular belief in nervous energy as a cause for disease during this time frame, a philosophy that came to be called brunonianism and became very popular between 1795 and 1810. Mesmer linked most his claims to such conditions of the nervous system as sleep walking and epilepsy. Some of his followers may have even applied it to better understanding the ongoing conditions of the mind, such as melancholy and nervousness, which could now be explained something other than just results of the passion. Still others linked Mesmer’s reasoning to the ability for one to be clairvoyant. Aside from John Brown (1735-1788), the inventor of brunonianism, Mesmer had his other supporters. One American supporter of Mesmer’s teaching was very interested in Mesmer’s claims was Benjamin Franklin. Franklin’s interpretations of electricity and the body included similar claims about nervous disorders, and the human psychological condition. Franklin claimed that a number of psychological problems or problems with temperament could be treated with this, along with some early versions of electroshock therapy provided on the side as well in the form of static electric generators and Leyden jars. This introduction of mesmerism to his students at West Point led Professor de Commun to begin teaching his own philosophy about disease and health in various local settings as it related to Mesmer’s claims. This included a speech that he gave at the New York Hall of Science in 1829, the bulk of which was published the same year as Three Lectures on Animal Magnetism (New York, 1829). Commun’s talks offered no further advancements in this philosophy or its practice locally. Some historians claim this had much to do with the Report of the Royal Commission on the topic of mesmerism produced in 1784. The local favorite, Ben Franklin, was a member of that Committee. Only a short time would pass before Mesmer’s teachings once again came to the United States. Two years later, in 1831, Mesmer’s claims were reviewed once again by the French Commission, who in light of several new discoveries made about the human body and its reactivity to such energies as electricity (along with others), they gave a more favorable report on the utility and value of this method of treatment. 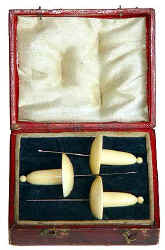 One of the few things we historians never really realize about this period in French medical history is that this is also when the French were successfully using and reporting on the values of acupuncture, in particular a special form of this treatment that they invented known as electro-acupuncture (1825-J. B. Sarlandiere, preceded by L. Berlioz practicing simple acupuncture in France, 1816). In some ways, like the experiences and influences expressed by Colden and Hahnemann just a few decades earlier, another interpretation of how this might work was being told by the medical philosophers for the time. Recent memories of those most learned in their field of medicine might have even recalled some of the earlier teachings in this field for the time, such as a book published by one of their own colleagues in England who had come to favor a similar energy of vital force related application of the needle in the skin. This English physician was Dr. James Morss Churchill, who practiced and wrote about the values of acupuncture in treating specific disorders for the time (he was preceded by William Coley in England, 1802). Mesmer’s words and philosophy were passed on to several successors. However, the most influential of these was Puységur. In 1802, Puységur coined the term mesmerism to describe this type of practice. This word later became official when it appeared in some writings in 1829. Mesmer’s philosophy was brought to North America several times. According to one of his followers who became quite an influential practitioner, Phineas Parkhurst Quimby, this philosophy was introduced to the United States by a French gentleman, M. Charles Poyen. Charles Poyen came to American as a fresh graduate of his medical school in France around 1839. It was nearing what would later be called the Transcendental Period in medical and sociological history, which according to some authors began as early as 1828 and as late as 1865. Poyen’s tour took place mostly along the routes linking the major coastal cities. During this time, he managed to influence many of the followers of the “new age” human philosophy teachings that were attracting people who were no longer interested in hearing about something as old-fashioned as simple human temperament. He likened our physiological powers to a force related to the same energy and force that directs the stars, planets, moons and pretty, much anything out there that Nature was willing to assign a life and ability to move to. This magnetism he claimed was some sort of power that transcended space in some mysterious way and upon reaching the earth was capable of influencing all of us. He used this philosophy to argue that illness could be influenced by the mind due to this power, and began to promote the idea that through this energy-related transformation we could be put through, that our disease state could be changed. Poyen’s influences were followed by those like Dr. Robert H. Collyer (1814-1891). Collyer is a much later addition into this field, having entered it about the same time as Dods. (For more on Collyer see http://www.eapoe.org/people/collyerh.htm). A lot of Collyer’s published writings were a direct source for inspiration on behalf of Dods and vice versa. Both of these metaphysical philosophers focused on the elements of human psychology had a significant impact on science in general, but especially those fields developing along non-allopathic routes. The discovery of galvanism, the Faraday circuit, and ultimately electricity as we know it today in the home, generated as many new routes to engineers and physicians as they did to metaphysicians like Collyer and Dods. Dods’ discovery of this Electricity came about in 1830, perhaps due to attending one of the local lectures on Mesmerism. By 1832 he began by lecturing his discovery at the Lyceum in Taunton, Massachusetts. In just two lectures, Dods went on to describe Electricity as the connecting link between mind and matter, a concept which had already made its rounds through New England several decades earlier when mesmerism first became quite popular. By the 1830s, Dods had added to the definition of electricity the concept that it was “the grand agent employed by the Creator, to move and govern the Universe.” By taking parts of the philosophy of mesmerism, truncating them, and then adding his own thinking, Dods rejuvenated this basic topic of public lectures. Dods made his participants drink water and think it was honey, lemonade, coffee, or even brandy. He could make them imagine the “threatening thundercloud,” leading them to flee to find a place of shelter. All along, Dods claimed he could accomplish this while they appeared awake and “in possession of their faculties.” To further convince any skeptical audience member of this claim, he recollected statements of support provided to him by others laboring in this spiritual healing world. One of these was Hiram Bostwick, an Esquire residing in Auburn County, New York (alongside Syracuse), who witnessed Dr. Dods’s heal his inability to walk and blindness to the differences between light and dark due to “a stroke of palsy” he had. He was cured less than a week after meeting with Dods . Dod’s reply must have been gratifying, for he wrote to them: “In reply to yours of Feb. 12th, I would respectfully say, that I feel myself highly honored to receive an invitation from you, to lecture upon the philosophy of Electric Psychology in the United States Capitol. With this invitation I comply, and it affords me much pleasure to do so.” The following Saturday evening, within four days of receiving his letter, Dods was in Washington talking about Electric Psychology at 7:30 in the evening. Following this lecture, Dods’ own version of this new psychology specialty become quite popular. Dods’ background was suspicious to the members of congress who requested this lecture on his philosophy, but in the long run, like any popular culture belief, congress can do very little to satisfy these types of societal needs. This lecture on “Mesmerism in Baltimore” was published in the top medical journal for the time ( Boston Med Surg J 1843; 28:359-362. June 7, 1843; see http://www.nejm.org/doi/pdf/10.1056/NEJM184306070281804), but to no avail. Dods had accomplished his task. The separation of “‘church’ and state”, at least from Reverend John Bovee Dods’ point of view, along with freedom of speech and freedom of press rights, remained intact. He probably realized however that more than likely most members of the United States government were still not convinced. Reverend John Bovee Dods began preaching his healing faith in New York about 1830. X. Electro-Curapathy is the best medical system in being, as it onvolves the excellences of all other systems. Beauty, harmony, order, electricity and balance in the body were some of the key concepts in Dod’s teaching. As part of the transcendental movement, this concept was not at all unique to Dod’s way of thinking, or marketing when it came to promoting his philosophy. Ever since the creation of animus and anima in Latin tradition, these terms have come to be related to metaphysics of the body. Once the most primitive forms of vitality associated withthe body came to be known, the animal magnetism, or in Dod’s terms animal electricity of one’s soma or corpus (body), the ability to separate the animal behaviors from the more carefully orchestrated human behaviors became more important to psychological medical philosophy and tradition by the 1820s. This concept would lead in turn the separation or splitting of body and mind in medical tradition, and offer the newer alternatives in health care and maintenance the opportunity to pave their way into the medical community. A review of Dod’s lectures at times seems very much like seminars offered today in professional and community settings. The faith healer of the local church, the specialist in auras at the local metaphysical book shop, the energy specialist using these skills to define the best plant medicine, all have a professional dictionary like Dods with a unique terminology all their own. This particular form of human behavior has not changed since the first herbalist drew up on the wall of a cave the sun in relation to the crow and the tree with a symbolically medicinal bark that “speaks to us”. Dods began his series of lectures with the comment “I have received an invitation from several eminent members of the United States Senate, to deliver a Lecture on the Science of Electrical Psychology–the philosophy of disease–the connecting link between mind and matter–their reciprocal action upon each other, and the grand operations of nature that this science may involve.” Dods then discussed his concept of “the Creator of the Universe” who “has endowed man with reason, and assigned him a noble and intelligent rank in the scale of intellectual and moral being–and he has commanded him to use this faculty…” He shared as well his respect for NATURE noting “the magnificent ROBE she wears,” paying Her back the respect he felt She was due to the incessation of cycles and the changes made by Her during these periods of time. At the conclusion of his presentation to the Congessional members in Washington, D.C., Dods had at hand the newspapers in which these proceedings were published in order to refute any of those in the audience who remained hecklers and disbelievers. Dods closed his first lecture to Congress by making several more claims about testimonies of those bearing faith in his healing profession, defines the trine he plans to cover in the lectures that follow: MESMERISM is the doctrine of sympathy; ELECTRICAL PSYCHOLOGY is the doctrine of IMPRESSIONS; MESMERISM and SOMNAMBULISM are identical. Whereas Mesmerists were taught “a sympathy so perfect between the magnetizer and subject…the person in the electro-psychological state has no such sympathies with his operator.” Mesmer taught his patients what and who they were in his sense, Dods’s patients experienced senses of their own design in the somnambular state. These slight differences he used to explain why some couldn’t become mesmerized, and yet could be electro-psychologically changed. Thus even skeptics of other mesmerist-like healing faiths remained open to suggestion, at least in Dods’s point of view as the inventor of this healing faith. Dods’s second lecture further defined his basic healing principles, and recapitulated such things as “GREAT LAW of the Universe,” the GENIUS phenomenon, theology, and intellectual and moral truths. Dods’ fourth lecture defined the dualities residing within these systems such as positive and negative forces, likening them to other natural phenomena such as positive and negative blood (arterial and venous), the positive and negative forces within the lungs, which if thrown out of balance can convert the mental electricity of the being into a state of imbalance. His fifth lecture pertained to the “Philosophy of being Aclimated,” which Dods uses to explain why those who migrate, and so change their foods and living conditions, often become ill in the new world. Dods ends by citing the history of a case treated by Dr. John C. Warren, the first President of Harvard Medical School. It detailed a tumor considered untreatable by regular. The lady was so-afflicted that she asked for Warren’s advice regarding treatment by rubbing the “the hand of a dead person,” which due to his support of the power of imagination, he supported the lady attmept to try it. According to Warren’s writings, she was completely cured in just a few weeks. Dods attributed this cure to the effect of electricity, brought about by mental impression upon voluntary nerves. Underlying this statement are beliefs inherent to both allopathic and alternative healing faiths. Therefore Dods followed this statement up with immediate mention of hydropathy, representative of one of four humoural elements [water, earth, air, and fire], He treated this as a sacred entity which made up the understanding of human conditions as it was judged by allopaths. Two more of the humours come into play in this discussion when Dods mentions terrapathy (earth) and aeropathy (air). The remaining element (fire), exists within his healing faith of electropathy. Throughout these arguments, numerology resurfaces in Dods’s thinking. The trine of electricity, galvanism and magnetism are described as one part of the total cure to be performed: “These three should be passede through different parts of the human system to ease pain, and remove nervous obstructions and nervous diseases by thus equalizing the nervous force.” He defines “the grand divisions of nature” as electricity, air and water. And he discusses the duality of electric cure as “the agent of the mind and the invisible power of matter.” For terrapathy, he includes the use of rich, fertile earth, in the treatment, or the products of that earth such as food. Dods’s eleventh lecture “Private Instruction to the Class. The Secret Revealed” was written after his financial success came due to the lecture circuit. In it he reveals more on his methods of teaching and dealing out degrees to those who complete this stage in their education. By pressing this nerve, it was felt sensations were transmitted back to the spinal cord, where it physically and anatomically ends. But in Electric Psychological thinking, this nerve next makes connections needed to ascend the spinal column until it reaches the cerebrum. By pressing it, one makes this nerve overcome the electric powers of all others. He used it to treat “persons most difficult to control” and “those who are most sensitive and impressible.” When choosing between the Ulnar and Median Nerve, Dods recommended the latter in his new writings, meaning that this book was meant to surpass the knowledge previously taught by his earlier students borne out of Washington, D.C. politics. This procedure was meant to cast a spell of sorts on these people. The result of this hypnotism would be the establishment of a psychological state in which Electric Psychology could be practiced. Another use for the Galvanic Coin was to rely on it for achieving a passive mental state when amongst crowds. Dods recommends that entire crowds join hands in a circle to experience its galvanic effect: “let the current be so gradiated as then be but faintly felt.” He claims this should take place by standing there for about twenty or thirty minutes, with his coin held by one or more members of the circle. Dods has now defined all of his methods of eliciting cure through the practice of Electric Psychology. As he gave order to the different healing methods, he recommended that five plans to be remembered. The first three make use of “the mediums through which persons are brought into the electro-psychological state.” These are Mesmerism, “pressure on the nerve by which we detect those who are naturally in the electro-psychological state,” and the use of the coin. The fourth is to make use of all of the previous three to perform the sanative cure, basing this process on the use of hydropathy, terrapathy, aeropathy, etc. The fifth stage is when you attempt to cure disease by the application of physical objects and remedies. He calls these phases of treatment Numbers one through five. Once during these lectures, Dods eludes to his cohorts in Phrenology by noting the phrenological Organ of Individuality “through which organ all ideas and all impressions are transmitted from the external world to the mind.” This organ he defines as the site through which “volitions of the mind” can be transferred to the rest of the body, likening its approach mentally through physical means by making contact with the median nerve. He closes his published lecture set with a brief presentation to ladies on Human Beauty, which he first called Natalology as he presented it to the Ladies of Troy in Morris Place Hall, New York, February 1844. John Bovee Dods. The Philosophy of Electric Psychology: in a course of Twelve Lectures. (New York: Fowlers and Wells, 1851), p. 18. Ibid. p. 23. Somnambulism (def. ): sleep-walking. DODS, John Bovee, philosopher, born in New York City in 1795 ; died in Brooklyn, New York, 21 March 1872. His life was largely devoted to the study of mental philosophy. He published “Thirty Sermons” “Philosophy of Mesmerism” (New York, 1847) “Philosophy of Electrical Psychology” (1849) “Immortality Triumphant” (1852); and ” Spirit Manifestations Examined and Explained” (1854). Eric T. Carlson. Charles Poyen brings Mesmerism to America. Journal of the History of Medicine and Allied Health Sciences, vol. 15 (1960), pp. 121-132. 1. Online Etymology Dictionary. (2001). “Psychology”. 3. (Steven Blankaart, p. 13) as quoted in “psychology n.” A Dictionary of Psychology. Edited by Andrew M. Colman. Oxford University Press 2009. Oxford Reference Online. Oxford University Press. Friedrich Anton Mesmer (1734-1815), a Viennese physician who conceived the idea that diseases could be healed by stroking the afflicted parts of the patient’s body with magnets. Later he discovered that the same healing effect could be produced by stroking or making passes over the afflicted parts with the hands. Hence the name animal magnetism as descriptive of this method of healing which today is generally called mesmerism. Friedrich Anton Mesmer (1734-1815) Austrian physician who rediscovered and applied the human magnetic fluid, called animal magnetism and then mesmerism. “He was an initiated member of the Brotherhoods of the Fratres Lucis and of Lukshoor (or Luxor), or the Egyptian Branch of the latter. It was the Council of ‘Luxor’ which selected him — according to the orders of the ‘Great Brotherhood’ — to act in the XVIIIth century as their usual pioneer, sent in the last quarter of every century to enlighten a small portion of the Western nations in occult lore. It was St. Germain who supervised the development of events in this case; and later Cagloistro was commissioned to help, but having made a series of mistakes, more or less fatal, he was recalled. . . . Mesmer founded the ‘Order of Universal Harmony’ in 1783, in which presumably only animal magnetism was taught, but which in reality expounded the tenets of Hippocrates, the methods of the ancient Asclepieia, the Temples of Healing, and many other occult sciences” (TG 213-4).